All the leading malayalam television channels are ready for 2018 thrissur pooram live telecast. They have started the preparations for setting up camera and other equipment’s. we have wide options for enjoying the most popular temple festival of kerala. every year all major tv channels carrying the live coverage of Thrissur pooram. we can also enjoy the same through national web casting service. 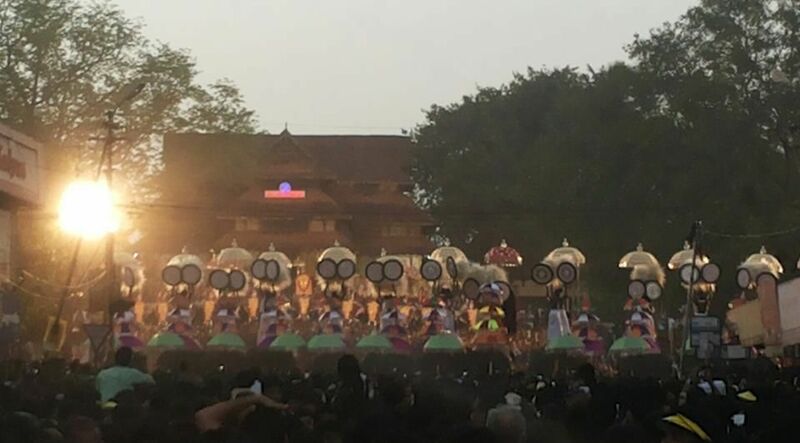 if you are not in kerala or thrissur, now worry all leading malayalam channels will capture the vibrant colors of pooram through tv screens. only few more hours for the grand opening’s of 2018 pooram festival. Live telecast of thrissur pooram from thekkinkadu maithanam on 25th April 2018 will be available through DD Malayalam, Kairali TV, Amrita TV, Asianet News, Reporter TV, Janam TV, Manorama News, Media One and Other Channels. There is no exclusive rights for airing the pooram festival. Lot of malayalees are waiting for the live telecast of this event through tv and applications. zee5 is one of the useful app for watching dd malayalam live, this is one of the official source or link for dd4 live. we can also expect the same through youtube channels of different tv networks. Thrissur Pooram Date 2018 – Wednesday 25th April at Vadakkunnathan Temple, Thrissur . Thiruvambady Side are Thiruvambadi Sri Krishna Temple,Kanimangalam Sastha Temple, Laloor Bhagavathy Temple, Sree Karthyayani Temple Ayyanthole, Nethilakkavu Baghavathy Temple. Paramekkavu side are Paramekkavu Bagavathi Temple, Chembukkavu Bhagavathy Temple. Panamukkumpally Sastha Temple. Choorakkottukavu Bhagavathy Temple, Pookattikkara Karamukku Baghavathy Temple. Disclaimer – keralatv.in do not streaming any videos, we are just discussing about the possible official sources for watching 2018 Thrissur Pooram Online.